How do you tell a family’s story? How to write, publish, and share it with your family, or anyone else for that matter? 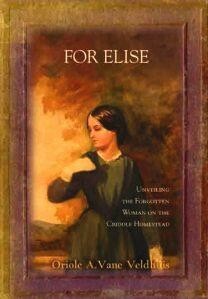 Such was the dilemma, and the beginning of a 12 year journey for Oriole Veldhuis, author of For Elise: Unveiling the Forgotten Woman in the Criddle Homestead. For Elise tells the story of servant Elise Vane, nee Harrer. Percy Criddle was an eccentric homesteader who arrived in Manitoba in August 1882 with his wife and four young children, as well as Elise, dubbed the Dutchman, with five older children, to homestead south east of Brandon near what is now the CFB Shilo. For Oriole it was a long incubating period for a promise she made to her ailing father in 1977. At retirement in 2000 she finally set out to untangle the web of Percy’s mysterious German mistress with an amazing sense of humor and adventure. She began the project with the translation of fragile German letters and armed with their information began a letter-writing campaign to find possible German connections. Oriole struck genealogy gold when she found long lost relatives that had no idea they had any in Canada. During three trips to Germany Oriole was able to learn about her family’s history. The translated letters would prove critical in shaping the story and understanding the relationship between the lonely servant and her loving family in the distant homeland. Throughout the project libraries played an important role in helping Oriole complete her research, offer workshops to develop her narrative skills, and eventually self-publish. Western Manitoba Regional Library, with its oral history collection and early newspapers, plus museums and archives played an important role in helping her piece together the otherwise invisible life of Elise Vane. Since Percy and Elise’s early life together took place in England, interlibrary loan also played an important part in helping her piece together their London lives, with maps etc., otherwise inaccessible from Southern Manitoba. The Writer in Residence Program at Winnipeg Public Library, helped drive her creativity with feedback received through the evaluation process of her early drafts. Doug Whiteway and Maurice Mierau, two Winnipeg Public Library writers in residence, helped Oriole realize that self-publishing was the route she needed to take. In addition to understanding how to get her tome published, there was the work of deciding what genre her story would be. Realizing it was not a Romance, and not entirely Horror, nor Historic Fiction, she decided upon Creative Non-Fiction (with a genealogical twist). It takes a community to self-publish a work as detailed and well-researched as For Elise. To make sure every aspect of the novel was true to its subject matter, Oriole elicited feedback from experts in their fields: a social worker, an agriculturalist, an ordained minister, a naturalist, and a medical doctor, as well as family members for names, dates, and spellings. Her husband and a German speaking friend also played an important role in the editing process as she re-wrote the story countless times out of respect for her great-grandmother and to get it just right for her family. The success of the book is in many ways a product of the professionalism with which it was produced, having been edited by a professional copy editor and having a graphic designer create the cover using a water-colour painted by Elise, set in a frame from the cover of her well-loved poetry book. Friesens Corportation, Altona, MB worked closely with Oriole on the printing process. She was present on the day it went to press. “It was most exciting to see the pages glide past our eyes after 12 years of slow and painstaking labour,” writes Oriole in an email interview after an author’s reading at Western Manitoba Regional Library. Oriole is enjoying the book’s success, now in its third printing, as she shares Elise’s story at author readings across the province. Her presentation is filled with humour as she recounts the tragic tale of Elise’s exploitation in rural Manitoba. She shares anecdotes about the process of researching one’s genealogy, as well as actually writing the book – all 512 pages with photographs, original documents, index, and copies of letters written between Elise, her children and her family in Mannheim and Karlsruhe, Germany. For Elise is perfect for any Manitoba library looking to add a piece of women’s pioneer history to their collection. Article submitted by Leslie Corbay, Library Accessibility Consultant, Manitoba Public Library Services Branch. Reprinted with minor changes and permission.